With this drive system mounted on a properly polar-aligned telescope, the user can do visual observations or sketches without objects constantly drifting out of the field if view. Astrophotography is also possible when a mount has dual-axis drive with drive corrector capabilities. 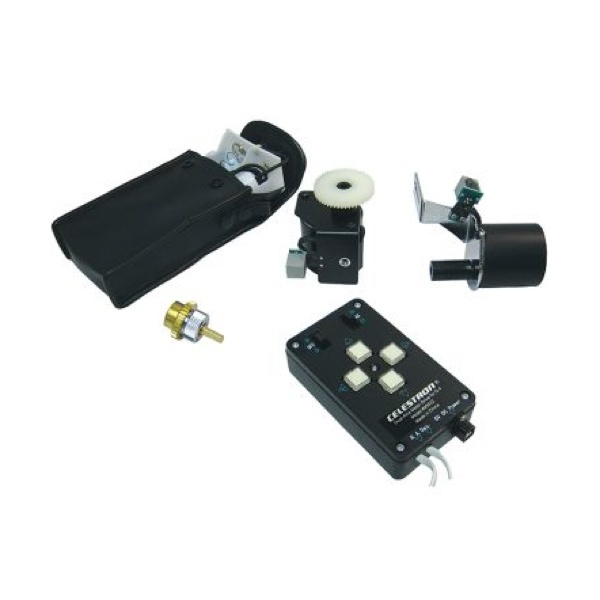 The drive corrector hand controller can be used to move the telescope at different speeds. This is achieved by choosing the desired speed on a switch marked “2x/4x/8x.” Twice the sidereal rate, or 2x, is used for guiding on a star when doing astrophotography. The 4x speed is used to center objects in the eyepiece. The 8x speed can be used for centering objects in the finderscope as well as the eyepiece. Install this DA motor drive on your CG-4 equatorial mount and open the door for astrophotography! Dual-axis drive motors track the stars as they move across the sky. The three-speed drive corrector lets you make tracking adjustments in all four directions. Can be used in the Northern or Southern Hemisphere. DC motor drive uses four D-cell batteries (user supplied).